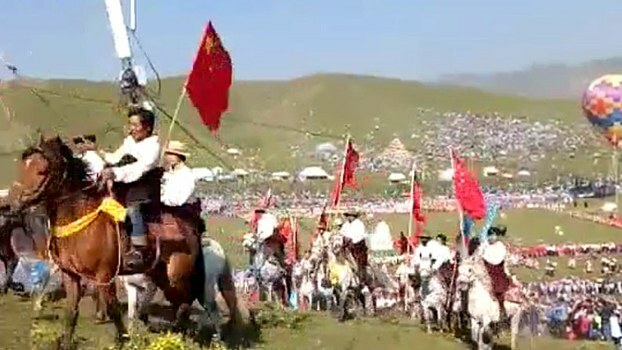 (TibetanReview.net, Jul20, 2017) – Residents in a historically Tibetan area of what is now part of China’s Gansu Province had been coerced by the authorities to carry Red Flags of the country during the opening on Jul 17 of a traditional local horseracing festival in a propaganda effort to make them appear to love communist China. The action angered both Tibetan onlookers and participants, reported the Tibetan Service of Radio Free Asia (Washington) Jul 18. The festival is said to mark the beginning the three-day traditional picnic season in the Tsoe (Chinese: Hezuo) City of Gansu Province. “This year, the Chinese authorities ordered ordinary Tibetans to carry the Chinese flags, warning them of severe consequences if they fail to comply,” RFA quoted a local source as saying, speaking on condition of anonymity. Chinese authorities thrust those flags into the hands of those participating in the inaugural procession, thereby offending and angering them deeply, the report cited the source as saying. The report said three years ago, similar pressure was exerted during the same festival and the Tibetans at that time defied the Chinese authorities and instead chose to carry religious flags. The Chinese authorities responded by sending in about 150 Chinese soldiers whom they had dressed in traditional Tibetan clothing and made them to carry the flags at the event.